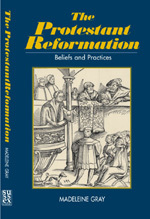 The Protestant Reformation has been the subject of much recent debate among theologians and church historians. Controversy still rages over the state of the late medieval church, the extent to which the Reformation was driven by theological or political concerns, and the impact which it had on the lives and beliefs of ordinary people. This Student Introduction provides an overview of some of the main themes of religious thinking in this period while giving weight to the multifaceted nature of belief. Particular attention is paid to developments in the practice of worship, and to the impact of the Reformation on ideas of the relationship between the church and secular society. Recent research on the social anthropology of the Reformation is discussed in the context of the extent to which the beliefs and practices of ordinary people were affected by the changing perspectives of theologians and rulers. The present text is written with the modern undergraduate in mind, and is the direct result of teaching experience. This is a market which is not always addressed by existing books, many of which assume a background in Christian thought which few undergraduates now possess. While not for the complete novice, this book assumes very little previous knowledge. Important concepts are explained in simple terms at the outset and glossaries and biographical guides are provided for further reference. Topics include: sin and salvation; sacrament and ritual; authority and interpretation; the theory and organization of the True Church in the Protestant tradition; the Protestant churches and secular authority; literacy, education and the popular response to the Reformation; liturgy and the articulation of belief; popular belief and folk culture. The clergy: priests or ministers? The Revolution of the Saints? Admirable help for readers is provided in excellent glossaries of the reformers and theological terms, and in a well-chosen list of recommendations for further reading. The author makes the topics understandable and interesting. Recommended. One of the biggest advantages of this work for the beginning student is its stylistic simplicity. The author is deeply aware that unfamiliar technical language can be an enormous obstacle for beginning students of theology and church history … the other major advantage for this work has to do with its contents and organization. From beginning to end, there is a consistent pattern of presentation… Finally, while this work is ideally suited for beginning college and seminary students, there is much in it to commend it to the more advanced student as well as to the professional theologian and church historian … In these and other respects, this work is at once a highly accessible and subtly provocative summary of the beliefs and practices constitutive of the Protestant Reformation. One of the strengths of this book is its a readable prose. An instructor will find the material a pleasant refresher on doctrinal particularities, and the student will appreciate a text that is easily digested. To assist the student, Gray also includes occasional reference to scriptural passages from which a certain Christian belief or practice sprang, and helps unravel some knotty concepts – such as imparted and imputed righteousness, original sin, predestination, and those in Eucharistic theology – that were centrepieces of the Protestant Reformation, but which are frequently unfamiliar to today’s students…Gray’s book commends itself for consideration in a college course, and college as well as lay students of the Reformation will find it a lucid overview of what the Protestant Reformers were after and why.